This past Friday night we had the pleasure of visiting Lansky’s Pizza, Pasta and Phillies at their Bellevue, Nebraska location. 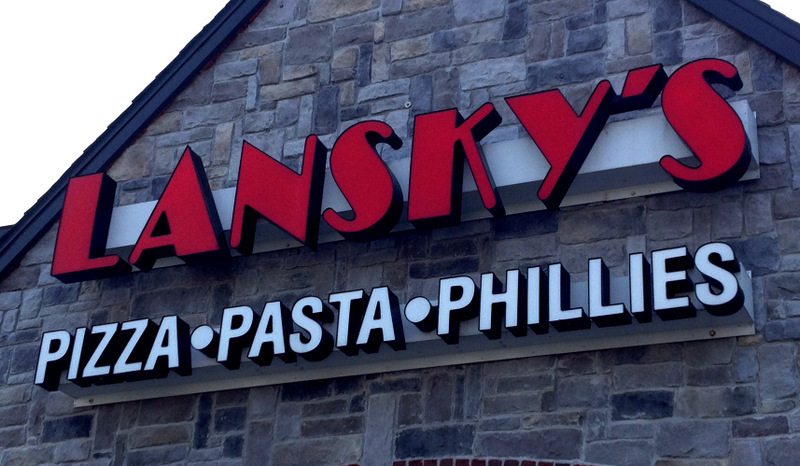 According to their website, Lansky’s has been turning out great Philly steak sandwiches and pizzas for 16 plus years in Omaha and Council Bluffs, and they most recently opened a third restaurant in Bellevue in 2004. The Bellevue location was slightly closer for us, so away we went. 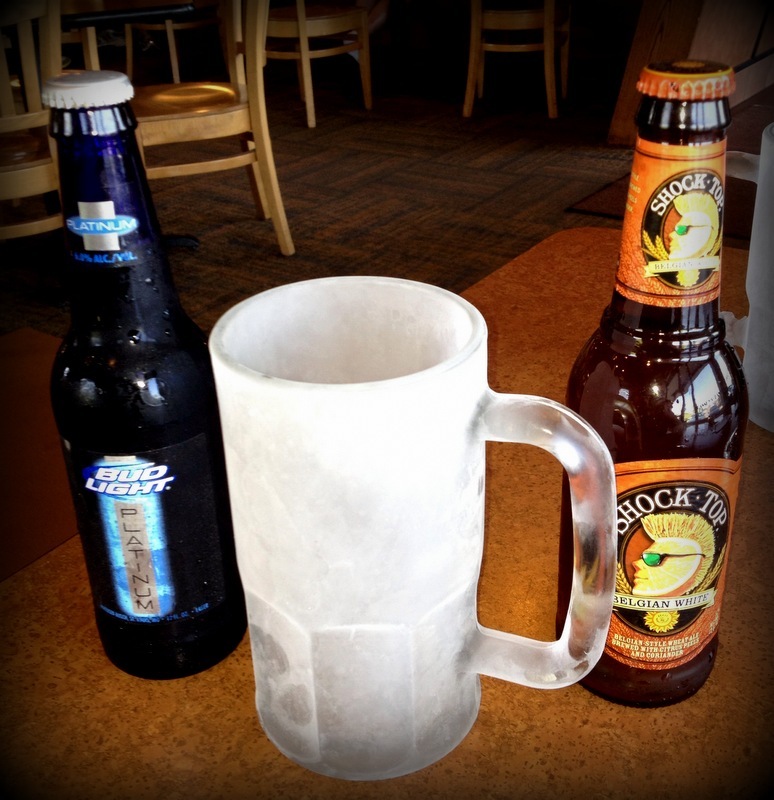 Ice cold beer and frosty mugs! The Bellevue restaurant is a rather large place with plenty of seating. You enter right at the front counter, study the menu, place your order, pay, grab a number and find an open table. Beers (on ice and with frosty mugs!) are located at the ordering counter while a soda fountain and salad bar are located just around the corner. The menu is nothing short of huge. 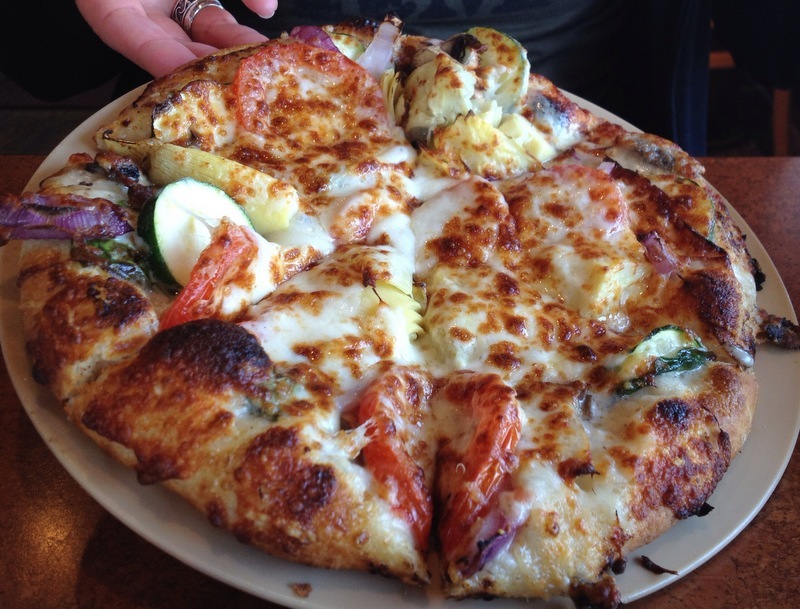 They feature no less than 17 specialty pizzas including two veggie pizzas, which was a huge hit with The Pizza Wife! 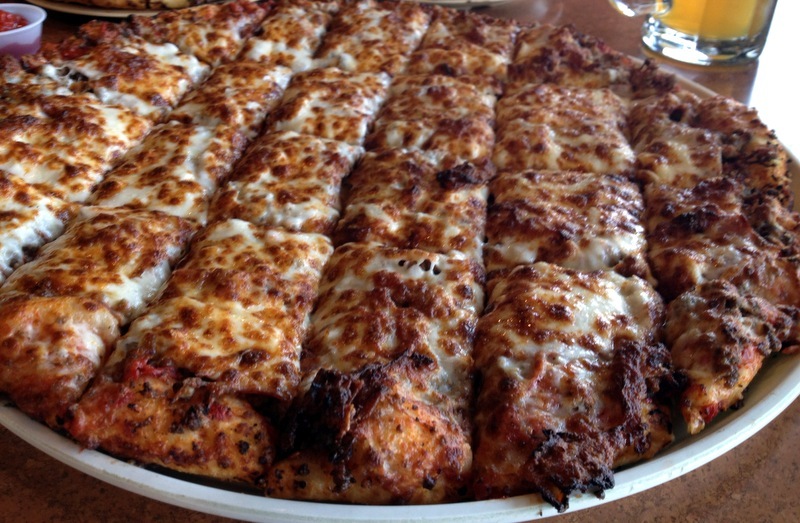 Another cheer came for the 8″ personal pizzas. Additionally they feature calzones, specialty sandwiches, including a French Dip and Classic Reuben, famous steak and chicken phillies, starters such as onion rings and ravioli, pastas, salads, kid’s meals and desserts. Tonight we didn’t hold back. We ordered a few beers, onion rings for an app, and three (yes, three) pizzas. What can I say, we like leftovers. We decided on the Butcher’s Special, the Veggie Supreme and the Chicken Pesto. 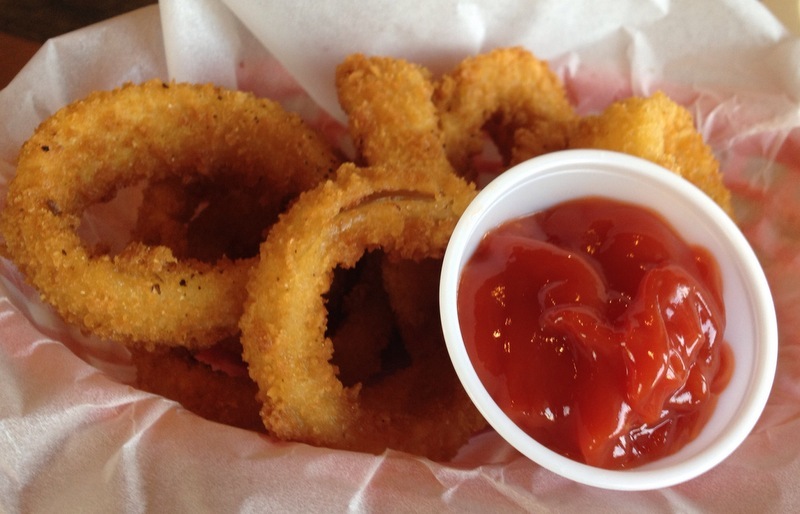 We’ll start with the onion rings, which were ridiculously good. The thick, seasoned batter clung nicely to the onion. They were crisp, ‘beefy’ and didn’t fall apart when folding or taking a bite. We (ok, I) plowed through a half order in no time. These rival only the rings we had the pleasure of experiencing in Kauai, Hawaii in 2001. 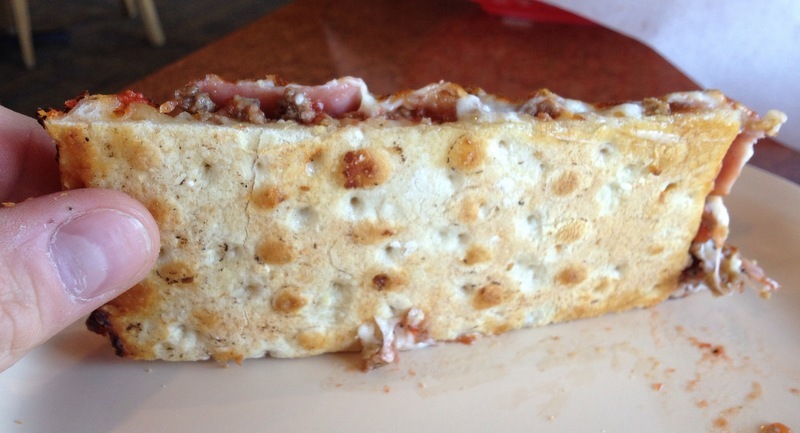 The crusts at Lansky’s are, much like Mama’s Pizza and Mangia, a medium thickness and baked in a conveyor oven. Well at least I think Lansky’s uses a conveyor oven. Their bottoms have the tell tail signs of being cooked on a pizza screen. What made the crust at Lansky’s a bit different from the others in their category is that the crust had some nice browning and crispiness on the bottom – something that you usually don’t get without cooking on a stone. A little further investigation provided confirmation that they do indeed use a conveyor oven. They also use a dough docker prior to cooking to eliminate air bubbles while cooking. The Butchers Special was, without question, created with me in mind. All meat – no damn veggies. It comes loaded with hamburger (a midwest favorite), Canadian bacon, ‘regular’ bacon, spicy Italian sausage, mozzarella and romano cheese. Yeah, sounds good doesn’t it? Well it was. It was a meat symphony with each playing their own unique part. All of the ingredients seemed fresh and they were certainly plentiful. Even though I’m not much of a medium thickness pizza fan, I was pleasantly surprised with their crispier crust. If I had one complaint, it would be the sauce. The end product could have used a bit more in my opinion. Though to be fair when you having toppings such as hamburger on a pizza, the sauce tends to disappear. The addition of the romano cheese also added its own unique flavor profile to the pie. The Veggie Supreme was loaded with fresh vegetables and much to the delight of The Pizza Wife, contained few of the old standards (spinach, zucchini, mushrooms, red onions, artichokes, and Roma tomatoes adorned the pie). What made this pizza stand out was the exclusion of a tomato based sauce. It was instead topped with a garlic sauce. Though a bit runny (it made the crust soggy almost immediately), The Pizza Wife thought it was a brilliant idea to pair potentially bland vegetables with garlic. The Chicken Pesto was another delight for The Wife. It was topped with Lansky’s own freshly made pesto sauce, fresh grilled chicken (which got extra points for not being refrigerated, or at least it didn’t taste like it had been hanging in the fridge), tons of Roma tomatoes and quattro fromaggio. The pesto was flavorful but a little oilier than The Pizza Wife would have liked. 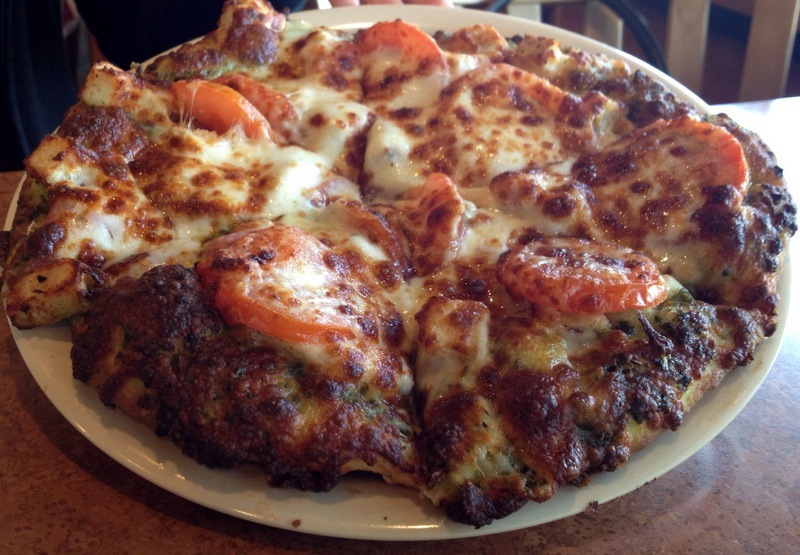 How would you rate Lansky’s Pizza? Click on the stars below! This entry was posted in Pizza and tagged Lansky's Pizza. Bookmark the permalink.